Mike Ruiz reviewing photos with model in makeup. Photo courtesy of Mike Ruiz. Photographer Mike Ruiz’s lens has captured every star in Hollywood’s celeb constellation from iconic beauties like Raquel Welch and Iman to today’s leading ladies like Emma Roberts and Zoe Saldana. For his 2011 coffee table book, Pretty Masculine, Mike turned it over to the guys, creating hyper-stylized images that reinterpret the classic male aesthetic. Looking to provoke thought and encourage dialogue regarding typical gender roles, Mike is continuing the conversation with the launch of The Pretty Masculine App to offer unprecedented access to his creative process shooting for the book. We caught up with Mike to learn more about how his tech savvy and philanthropic efforts are extending the benefits of Pretty Masculine beyond the images. Yep, there’s an app for that. Do you remember when you got your first camera? The year was 1993, and it was a Christmas gift from a friend of mine. Do you have a favorite photograph of the millions of images you’ve shot? I still really love the shot I took of Brooke Shields on my rooftop. Of the personalities you’ve photographed, who surprised you the most when they got in front of your camera? Actually I just directed a music video for a Japanese artist named Miho. She was very sweet and soft spoken upon meeting her, but when I called “ACTION” on the set, she came to life in a way that was drastically different from the woman that I had met an hour earlier. I wanted to explore the notion of masculinity and femininity. Mike Ruiz shooting a male model for Pretty Masculine. Photo courtesy of Mike Ruiz. The book’s app offers an interactive way for people to consume art. How do you feel this emerging technology has influenced your work and how people view it? I feel that it changes the way people consume art. By providing a myriad of interactive features and video clips corresponding to the images, the user has a broader understanding of the creative process and may view what they are seeing differently as a result. Proceeds from the app benefit several philanthropic organizations including the GMHC (Gay Men’s Health Crisis) The Ali Forney Center, Bullies and Buddies Animal Resource and Green Chimney. Can you tell us about some of these causes and why they have become so important to you? The reason these varied organizations resonate with me is because they all help the disenfranchised. Whether they are helping people living with HIV/AIDS, helping homeless GLBTQ youth, or finding loving homes for animals that have been discarded, they all deal with living beings that have been marginalized. I can identify with the feelings associated with being an outcast. If it’s not fun, it’s not worth doing. By that I mean, it is paramount to find the joy in everything that life offers you. 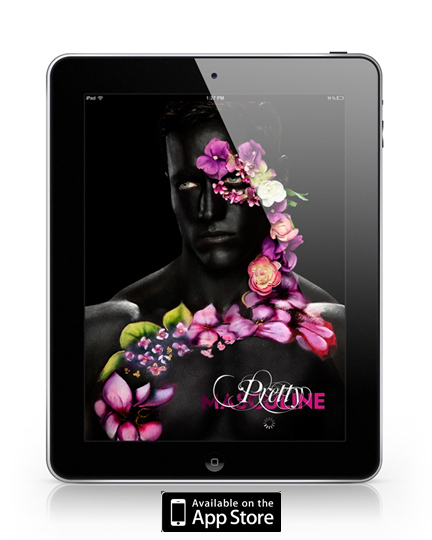 The Pretty Masculine app is currently available on iTunes for both the iPhone and iPad. For more “Industry Interviews”, click here.